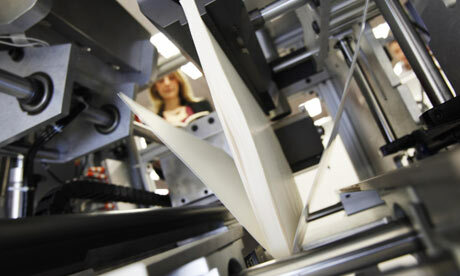 Google is giving 2 million books in its digital library a chance to be reincarnated as paperbacks. As part of a deal announced Thursday, Google is opening up part of its index to the maker of a high-speed publishing machine that can manufacture a paperback-bound book of about 300 pages in under five minutes. The new service is an acknowledgment by the Internet search leader that not everyone wants their books served up on a computer or an electronic reader like those made by Amazon.com Inc. and Sony Inc. 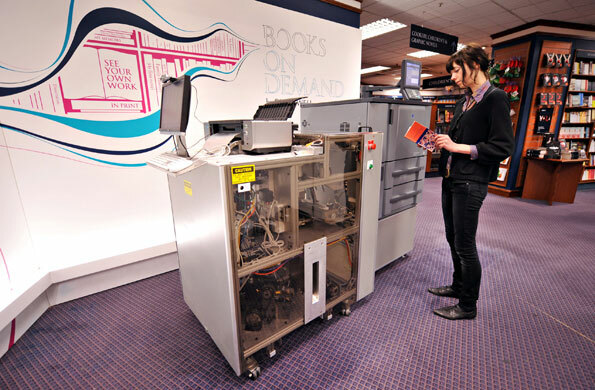 I have had the opportunity to use this machine in Blackwell – Charring Cross here in the UK earlier this year and It really does enhance the idea that we have reached the “Want Now’ era – there is no need to wait or even delay your day to go bookshop haunting or web trawling. If the book is not in the shop or the shop cannot get the book in stock by a certain time – then a print can be done and all at the same price for books in print or out of print books a little higher premium is charged, but it’s really worth it for a book you would never find again unless your odds are very good of finding it at a car boot sale. The article does not say which books are earmarked for reprinting, but I am sure this makes a whole generation of readers rub their hands in glee. "It's like things are coming full circle," Google spokeswoman Jennie Johnson said. "This will allow people to pick up the physical copy of a book even if there may be just one or two other copies in some library in this country, or maybe it's not even available in this country at all." If you get the chance to check out this machine, Please do – it is really something else and I loved my experience with it. Hi! I heard about this, and if it is exactly the same thing -- I'm guessing so, some authors were a little worried just who would get hold of a machine like this. In other words pumping out crap, just because they can afford the machine! LOL Makes me wonder, but at the same time, it IS an ingenious idea. I see pros and cons for it. By the way, I have given you a super award, and I thought of you straight away when I saw this! This award could almost have been designed with you in mind! Hope you like it. Very interesting. If I get the opportunity I would love to see this machine in action. Agree, we are really a "I want it now. WHAT? What DO you mean I have to wait? Tomorrow!?! Not good enough!" generation - Lol! I can see the pros and the cons as well.. I have to admit - I see more pros more than cons and I am hoping they don't run away with the distribution of such tech, but with self published authors and cost being as they are- it can only be a good thing all round.. It was an experience - As all first time event are.. If I need the use of it -I would most certainly use it..
You make me laugh - That is so my kids... no waiting, impatient as hell and with no apologies for it..